As the climate continues to warm, many U.S. cities are experiencing heavy rainfall more frequently. 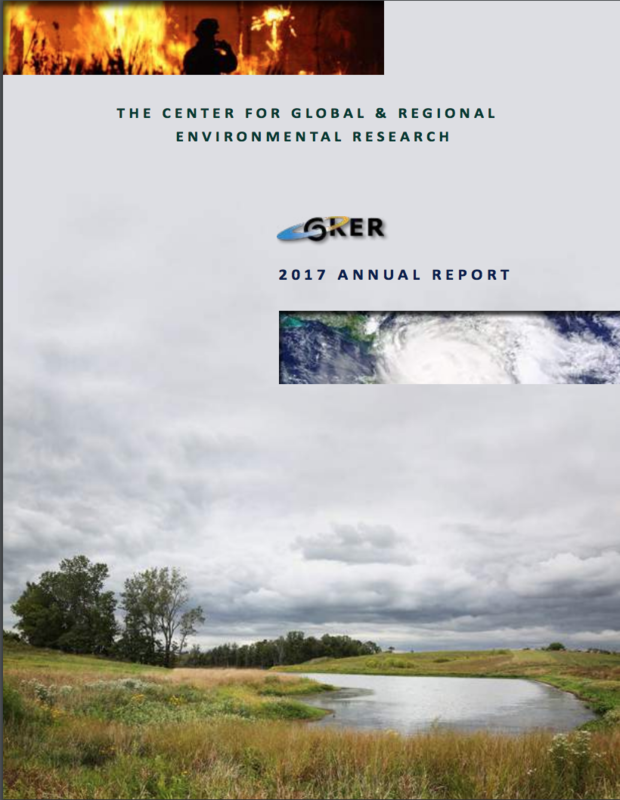 Research and news organization, Climate Central, examined the number of days per calendar year that each of 244 sites nationwide experienced 0.25, 0.50, 1, and 2 inches of precipitation from 1950 through 2017. The report found that incidents of heavy rain events are increasing in frequency in all regions of the U.S. 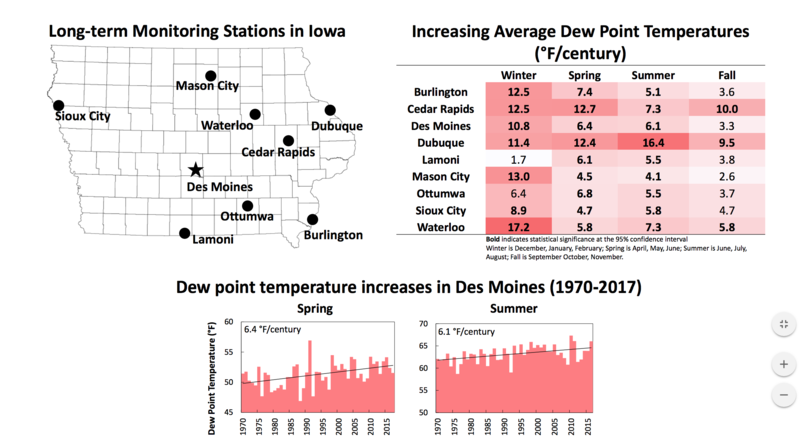 In Des Moines, the number of days per year where the city experienced two or more inches of precipitation has increased by about seven percent since 1950. For each 1°F of global warming, Earth’s atmosphere becomes four percent more saturated with water. This makes more moisture available to condense and fall down as precipitation. As a result, extreme floods are more likely to happen now than they were in the past. According to NOAA, 29 flood disasters that cost more than $1 billion each have happened since 1980. In Iowa alone, floods have caused more than $18 billion in damages in the last thirty years. That puts us in fourth place nationwide for the number of floods experienced since 1988. The northeastern United States has seen a 55 percent increase in heavy precipitation events from 1958 through 2016, the sharpest increase in the nation, according to the report. The midwest follows close behind, with a 42 percent increase in heavy precipitation events. Users can determine whether incidents of heavy rainfall have increased in Dubuque, Mason City, Ottumwa, Sioux City, and Waterloo by using Climate Central’s interactive map. A recent report from Iowa State University argues that removing nutrient pollution from Iowa’s water would provide economic benefits for the state. Economists with ISU’s Center for Agricultural and Rural Development (CARD) first summarize the cost of nutrient pollution in Iowa’s waterways. They write that forty-nine public water systems treat water for nitrate pollution either by using nitrate removal equipment or blending the water; these systems serve more than 10 percent of Iowa citizens. The report estimates that Iowa’s public water systems have paid $1.8 million to treat nitrate in the water since 2000. Smaller communities and rural areas are disproportionately affected by the economic consequences of polluted water. Many small town public water systems do not have the resources to purchase costly nitrate removal equipment and as a result, may not be able to meet the U.S. Environmental Protection Agency’s water quality regulations. Private wells go largely unregulated, so consumers are responsible for picking up the water treatment costs. Findings suggest that as many as a quarter of Iowa’s wells have unsafe nitrate levels in them. The report also comments on the lost revenue from water recreation income for the state. The number of beaches and waterways under advisory or closed each summer because of harmful algae blooms, which are fed by nitrate, continues to grow. Economists estimate that improving water quality in Iowa’s lakes by meeting Nutrient Reduction Strategy goals would increase recreational benefits for all Iowans by $30 million per year. Iowa Legislators recently passed a bill that will allocate $282 million to water quality improvement projects in the state over the next 12 years. Critics recognize, however, that scientists with the Nutrient Reduction Strategy have estimated that it will cost billions of dollars to adequately remove nutrient runoff from waterways in Iowa. To read CARD’s full report, click here.